FERC: regulatory agency or marketing firm for pipeline companies? Its name is the Federal Energy Regulatory Commission, but lately it’s been sounding more like a marketing firm for pipeline companies. You can help fix that. 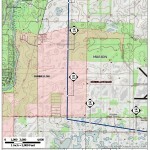 About 50 people attended an open house meeting held by Sabal Trail Transmission LLC, the energy firm that will construct the roughly 465-mile line for two of America’s biggest energy companies. The line will go through Alachua and Marion counties, among others…. The company, he said, is attempting to identify — and mitigate, if necessary — as many issues as possible before filing its application with the government, which should come in about a year.